Fig. 4.1 Life cycle of the Pacific salmon. Fig. 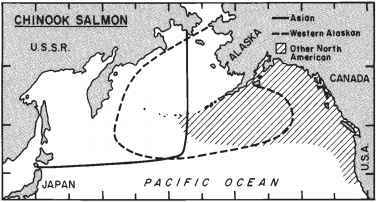 4.2 Generalized ocean distribution of chinook salmon from Asia, western Alaska, and other North American areas. Salmon are of primary importance to three major groups of North American harvesters: non-Indian commercial harvesters, Indians, and sports fishers. The Indian fishery has deep historical and cultural roots. The salmon fisheries were the mainstay of the northwestern Native American culture and livelihood. When settlers moved into the region they quickly began to exploit the salmon resource, at first for subsistence. By the late nineteenth century, major commercial fisheries were developing along the coast. As the region's population has grown, particularly in the post-World War II era, sport fishing for salmon has become increasingly important. The commercial fishery, which includes substantial Indian commercial fishing activity, accounts for most of the salmon harvested coastwide. The dollar value of the Pacific salmon fishery in today's terms is measured in the hundreds of millions of dollars and its direct employment is in the order of tens of thousands of persons on a seasonal basis. It has long been one of the most valuable commercial fisheries in the US, with Alaska accounting for most of the harvest (87% in 1987 and 1988) (National Marine Fisheries Service, 1988, 1989). The commercial salmon fishery in the northeastern Pacific is dominated by two nations - Canada and the US - although Japan has participated through international agreements (Jackson & Royce, 1987; Myers et al., 1987). Incidental catch by groundfish and driftnet fisheries has made other fishing interests, domestic and foreign, indirect parties to North American salmon fisheries (French, 1977). * Author's computations, data in numbers of fish. Source: INPFC (International North Pacific Fisheries Commission), Statistical Yearbook, 1980-85, (published 1983-88). purse seining, and trolling, with traps, set nets and weirs used in limited areas. As one moves northward along the coast, the commercial harvest of salmon is conducted with an increasing variety of gear types. Trolling is the predominant method of commercial harvest in California and Oregon, while net-type gears are more common in the other jurisdictions where pink, chum and sockeye account for a major proportion of the salmon harvest (e.g., Bathgate, 1984; Schelle & Muse, 1986). The sport fishery concentrates primarily on coho and chinook, although sport harvests of sockeye and pink appear to be increasing in Alaska, British Columbia, and Washington. Coastwide, sport fishing accounts for a small share of the salmon harvest; even of the harvest of the targeted coho and chinook. For historical reasons, the competition between these three groups appears to have been most intense in the State of Washington. In that state, the non-Indian commercial fishery competes with a relatively large sport fishery for coho and chinook, while the state's obligation to uphold treaties protecting the Indian salmon fishery was reaffirmed in the US courts by the landmark 1974 Boldt decision and subsequent court cases ( United States v. Washington, 1974). 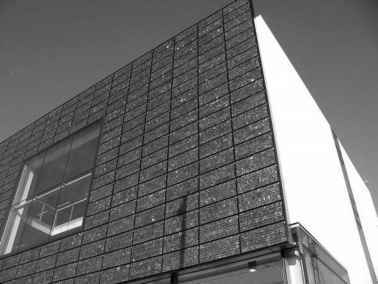 - all of which have varied in their effect and effectiveness (Cooley, 1963; Crutchfield & Pontecorvo, 1969; Netboy, 1980). Large interannual variations in the size of returning salmon runs have been a fact of life throughout the history of the salmon fishery. Commercial harvest statistics provide the only available long-term record of this variability and these statistics are available only for the last 80-100 years (Bell & Pruter, 1958; INPFC, 1979). Commercial and sport catch statistics are an imperfect measure of variations in stock abundance, for reasons noted by Nickelson & Lichatowich (1984). This presents problems for biologists seeking to understand the causes of variability in the individual stocks contributing to the coastal salmon fisheries. However, since the anadromous nature of salmon makes them quite easy to harvest and since most salmon stocks run a gauntlet of intensely competing gear units as they return to their spawning streams, it seems likely that the variability historically observed in coastwide commercial harvests has had its major roots in variations in stock abundance. At the local level, it is more difficult to ascribe variability in harvests to changes in stock abundance. Due to their migratory nature, salmon from any given area may be harvested far from their native streams. Local harvest rates may also vary due to local weather conditions, variations in market conditions or fishing skills, or due to alterations in management regimes designed to rebuild stocks. Commercial harvest records are available from 1920 to the present for Washington, British Columbia and Alaska. Shorter time series are available for commercial harvests in Oregon and California and for noncommercial harvests coastwide (INPFC, 1952-85; 1979). Long-term trends in the total commercial harvest of all salmon species by state and province can be seen in Figs. 4.3a-e. The figures record catch in terms of numbers of fish (thousands) rather than in terms of weight to make use of the longest available time series. The primary value of these figures is to depict the variability inherent in these fisheries, which is a striking feature of all of the time series. Alaska stands out as being by far the largest salmon producer. After peaking in the mid-1980s, Alaska's production declined to a low in 1959. Alaskan harvests recovered somewhat in the 1960s but dropped to record low levels in the early to mid-1970s. They have made a remarkable recovery to record high levels over the past decade. Some attribute this recovery to anomalously warm temperatures in the Gulf of Alaska and Bering Sea during the period 1976-84 (e.g., Rogers, 1984). Others cite improved management of the fishery (e.g., Royce, 1989). The reduction in the Japanese high-seas mothership fishery, brought about by the implementation in 1977 of the Fishery Conservation and Management Act (Public Law 94-265) and subsequent revisions of the North Pacific Treaty in 1978 and 1986, may also have contributed to recent record harvests in Alaska. However, the available evidence sug gests that the recent dramatic growth in Alaskan salmon harvests far exceeds the reduction in Japan's mothership harvest (Harris, 1988; INPFC annual series, 1978-85; National Marine Fisheries Service, 1988; 1989). 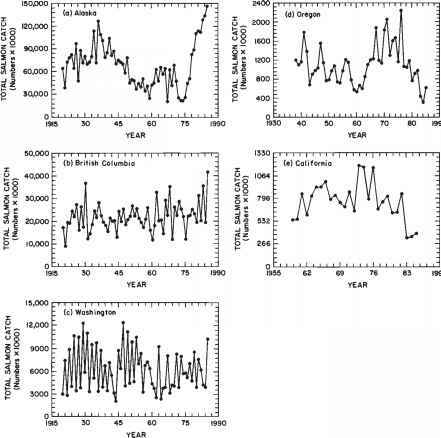 Commercial harvests in British Columbia, Washington, Oregon, and California have been quite variable over the period recorded. Sharp changes in harvest levels from one year to the next are not uncommon, and the odd-year runs of pink salmon in Washington result in a clearly sawtoothed pattern for that state's total salmon harvest. The mid-1970s were extremely productive years for coho and chinook along the southern part of the North American coast (see Figs. 4.4a-d and 4.5a-d). This elevated productivity has been attributed to anomalously cool waters and strong upwelling creating favorable conditions for salmon survival and growth (Nickelson, 1986). However, these record years marked the beginning of a declining trend for coho and chinook harvests. The fact that these harvests were declining immediately prior to the 1982-83 El Nino event makes it all the more difficult to determine the degree to which the low harvests of 1983 and 1984 can be attributed to El Nino. The causes of the variablity in salmon harvests are complex and only imperfectly understood. In their efforts to understand the nature and sources of this variability in harvests, biologists have investigated a great number of variables affecting salmon in freshwater habitats, estuaries, and in the ocean. Still, there is no agreement on which factor or factors can be used to predict variations in salmon abundance. Overfishing, particularly of weak stocks in mixed-stock fisheries (Bevan, 1988), variations in marine survival rates, environmental degradation, hatchery programs and changes in international fishing regulations have all been cited as causes of long-term changes in salmon abundance. Streamflow variability in spawning streams is also believed to contribute to variability in abundance. There have also been enormous negative impacts on salmon habitat through the construction of dams, irrigation facilities, dikes, and landfills as well as from industrial and agricultural pollution, forest management practices, and urbanization (Northwest Power Planning Council, 1986). Major efforts have been made to compensate for these activities and to augment natural runs of salmon by means of salmon hatchery construction and operation. In addition, there have been changes in fishing methods, locations and management activities. The presence of these confounding factors makes the task of identifying the role of climate-related variability in the marine environment almost insurmountable. Nevertheless, some evidence can be gleaned from El Niño events and from other periods of major change in the northeastern Pacific salmon fisheries.